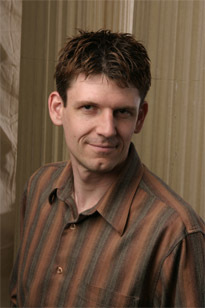 This week's photo was taken by an online friend of mine, Stuart Hancock while he was travelling in America. 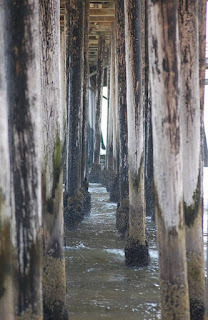 It shows legs of the pier on Pismo Beach, California. I asked him if I could use it because it is begging to be written for. So many tales are glimpsed between those posts. What will yours be? By all outward appearances, Vanessa was her best friend. She always smiled when they met, always had something flattering to say. Catherine also noticed how friendly she was with Robert, her boyfriend. It seemed innocent enough at first, but soon grew to the point of open flirtation. Although there was no indication Robert took it seriously, Catherine watched his eyes when she was around, concerned things might go further. Eventually, the situation became more than she could bear. Vanessa needed to learn her place. Catherine invited her for a walk along the water to have a talk and enjoy the day. The early morning air had a chill. Few people were on the beach. When Vanessa turned to look out over the ocean, the thin piece of driftwood Catherine had used for a walking stick came crashing down on her skull. It was enough to knock her down, enough to leave her helpless. Catherine dragged her to one of the pilings near the waterline. She took a length of strong twine from her pocket and looped it around the piling and Vanessa's neck, tying it tightly. The sharp edges of the barnacles cut into Vanessa's face. All the better, Catherine thought. Vanessa looked up, struggling with consciousness. "Robert's my boyfriend, Vanessa. I want you to think about that while the crabs chew on your toes. I'll be back once you've learned you're lesson—maybe." Time can get away from you when you're having a nice day on the shore. When Catherine returned, the water was several feet higher. She waded into the surf and searched around the piling, but Vanessa was gone. She looked up and down the beach. There was no Vanessa, no body—nothing. She hadn't meant to kill her—just frighten her a bit. She thought the tide was already in. Catherine sat upright in her bed, breathing heavily. Her hair was damp with sweat, her head throbbing. It was that nightmare again. It was always the same. She would fall asleep and her dreams would take her to the beach by the pier. Just before waking, the faceless form of a woman would appear, dripping wet and covered in green tendrils. It had to be Vanessa. Catherine got up to take something for her headache. She noticed how tired she looked in the bathroom mirror and turned on the hot water. The rising steam felt good. When she looked up, the words 'beware water' appeared on the mirror as if drawn by a finger. Catherine backed out of the bathroom, her heart pounding. She took a few steps when her foot touched something cold. She jumped back, then reached out with her toes to feel it again. The carpet was wet. Catherine turned on the light. Glistening footprints appeared at the foot of her bed. There was something green on the carpet. It looked like—seaweed. The phone rang startling her badly. It was her boyfriend, Robert. A woman's body, it seems, had been found on the beach, badly decomposed. There were no clues as to her identity or how she had died. He wanted to know if she was all right. Catherine broke down weeping. "I didn't mean to kill her." "You're not making any sense, Cathy. You couldn't hurt anyone." "I tied her to the pier, Robert, and she drowned. She wasn't supposed to die!" "It'll be okay, Cathy, but we need to discuss this. Meet me by the pier around nine o'clock. And try not to panic." "Okay, Robert. I love you." Catherine was pacing and visibly upset when Robert arrived. "Okay, Cathy—take a deep breath and tell me what happened." "I tied Vanessa to the piling." "Show me exactly what you did. Where was Vanessa?" Catherine sat on the wet sand and leaned against the shell-encrusted wood. A cord pulled tight against her throat. She tried to scream, but couldn't. A pair of hands grabbed Catherine's wrists, pulling her arms back. "Cathy, I'd like you to meet Cheryl. Sorry we don't have time to chat, but—what is there to say?" "Oh, and nobody blames you for Vanessa, honey," Cheryl added while checking the knots. "Things like that can happen when a girl messes with your guy. I hope you understand." Robert looked at Cathy, then shrugged. "Well, I guess this is goodbye. You know, they say two's company and three's a crowd, but four—that's just crazy." I wonder what Vanessa's spirit will do now...if it was Vanessa. It's not a good thing for authors to see book stores close. They've been trying to keep things going, but not enough people are buying books. Well, mysteries, anyway. Since their website will probably go away when they close, I took the liberty of copying some advice for writers to my site. I hope they don't mind... (if they do, please let me know). First off, understand that what for you is a moment of triumph and happiness of getting published doesn’t mean your work is over. Now you have to sell your book and yourself to the readers, who aren’t familiar with you yet! You will need to be able to tell people in a few sentences why they should take a chance on you. Be willing to put yourself forward, to explain why they will enjoy your book and what they’ll get out of it: laughs, fun, education, new views on topics, etc. As a new author, friends and family are your natural pool of buyers. Siblings, aunts, college roommates may assume you’ll give them a copy. However much you’d like to, Don’t. Why? After your signing event, your publisher will call us to ask how the signing went and how many copies were sold. If you’ve given away the free copies that your publisher sent, you may not sell many copies at the formal event. If you give away 20 copies and sell 4 at the signing, that unfortunately indicates to them a poor event. On the other hand, if you give only your parents and grandparents 1 copy each and sell 22 copies at the signing, the publisher will see it differently. We once had a first-time author complain about how he didn’t sell many at the signing but then allowed as how he’d given all of his author copies away. That explained why there were no sales – his natural pool of buyers was very shallow. Plus when you give away copies, we lose those sales as well. While we – your hosts – may have a good time at your first author event, we need to sell copies to stay in business. In the weeks leading up to your event, do all you can to promote it to those friends and family members. Use all of your resources – Facebook, Twitter, your Christmas list of e-mail addresses – anything that you use to keep in touch with friends and family. Don’t be shy and don’t think you can’t send out a first announcement and then a reminder as the event approaches. Recommend that they call or e-mail us to reserve a copy. Little can crimp a signing as quickly as Aunt Mimi coming in at the start of the signing and asking for a dozen copies, thereby taking a third of our stock. A couple of these customers can quickly wipe out our stock, thus people who come in later have nothing to purchase. All Aunt Mimi needs to do is call ahead, we can have her dozen covered without running low on stock. Similarly, you may hear from people who love to come but they just can’t make it (Uncle Hugo is in a bass fishing tournament that weekend, or your niece Becky has a piano recital or they live in Outer Mongolia and coming to Seattle is out of the question). Explain to them that they can still get a signed copy. Just call or e-mail in advance (again, doing it just as the signing begins is a bit too late) and we can ship them a copy! Sometimes life does get in the way of the best intentions. If you hear in the days and weeks after the signing from folks who are apologetic that they missed it and they’re sorry they couldn’t get a copy, tell no problem. All they have to do is call us and we’ll make arrangements, letting you know if we need you to come back to sign more stock. At your premiere signing, pay attention to strangers who may be at the margins of your crowd. It is easy to spend the entire time with friends and family, if you arrange to meet them after the event you are able to focus on those in the shop who could become your readers with a little extra effort. Back to your author copies. We’ve heard from many successful authors that they wish they still had a copy of their first book – they gave them all way and now the book has become collectable and they no longer have a copy. Keep them safe and secure, away from the possibility of water or moisture of any sort, away from dirt and spiders and sunlight. When you get them, sign and date them all on the title page and put ‘em in a safe place. In the years to come you’ll be glad you kept them. If life does get in the way of your scheduled signing, for heaven’s sake give us as much warning as possible. We once had an author cancel the day of the signing because he just couldn’t make it. Should that happen we can reschedule, our customers are very understanding. Do as much as you can to spread the word of the change (again, Facebook, Twitter, e-mails). These things happen and we can work to make the change relatively painless if we know as soon as possible. The most important thing to keep in mind is this: you’ve spent months or years writing your first book and it is gratifying to have friends and family gathering around you to help celebrate – that’s wonderful and we like to see it. But what is a successful signing for us is measure in book sales. So the day must be good for both sides. We want you to remember the event as a high point in your life and for everyone who attends to have a great time – but we also must sell books for it to be a success for us. If we do, we’ll all be smiling! It's sad to see these little book shops have a hard time surviving. That's the way it is, though. Come to think of it, I've never written a mystery. Maybe I should give it a try! 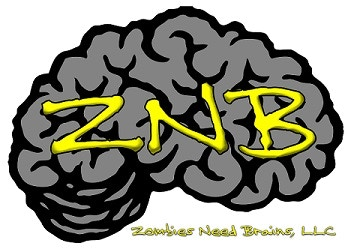 Please consider donating to the Zombie Need Brains sci-fi / fantasy anthology Kickstarter! While I know a lot of folks will be saying how cute this raccoon family is—and they are—they can transmit some serious parasites to humans, especially when they use your deck or yard as a latrine. See this page from the Centers for Disease Control for more information. This morning, Marie had the unenviable job of washing things down with boiling water. Chemicals, including chlorine bleach, do not reliably destroy the parasites, but heat does. We'll have to do something to deter them. Poop decks belong on ships, not houses. Eventually, they ambled off into the darkness. Then, while I nodded, nearly napping, suddenly there came a tapping, as of some one gently rapping, rapping at my chamber door. And I was right. But it wasn't a raven. It was this horrible creature... and a few of his friends. 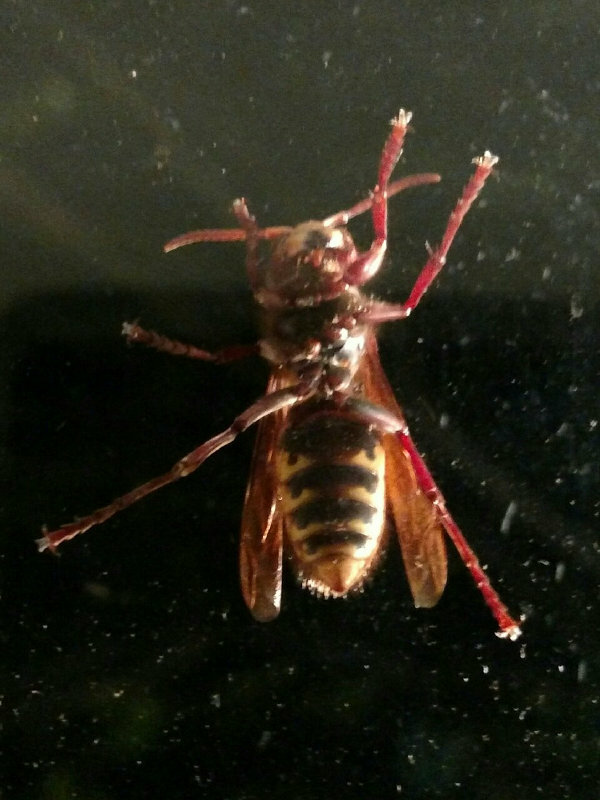 This is the European hornet. They fly at night and they're attracted to light. And they're big (like up to 35 mm big). They make a noise when the bang against your windows and glass doors trying to get to the lights inside. Maybe it's just me, but I don't really want them inside. I guess we'll be calling the pest control folks soon. I like my monsters in stories, not trying to get into the house. If you don't hear from me in a few days, ask someone to check up on me... You know, just in case more monsters show up.